Hey folks, Valkor here with day two of TOV’s CES coverage. This was the best day yet, though I have yet to see what Sony has cooking, I did get to check out the awesome power of HD-DVD. Now for those that don’t know, there will be two competing formats in the High Def – DVD market this year: Blu Ray and HD-DVD. HD-DVD has a huge backing of some of the best in motion pictures. The HD-DVD booth was big and very impressive, but I will not count out Blu Ray, because I know Sony, who is one of its supporters, will have something showing. (I hope). Other than that we have an impressive line-up of products including one such product that was located at a small booth, just out of the way of casual eyes. With that in mind, let’s get on with the show. Oh ya while I had originally wanted show both Blu Ray and HD DVD here with this piece, I decided that it would be better and more detailed to keep them separated. Microsoft had an amazing booth just at the entrance of south hall (??). Their biggest focus was Windows XP Media center, which is for all you multimedia buffs, also their portable media devices such as the Creative Zen player and Iriver. The Zen and the Iriver are nice, however very limiting in the formats they support especially when it comes to video. When asked if the Zen and Iriver support Divx, I was told they do not nor do they support Mpeg-4. Also it only shows video in 320X400 in xvga mode and to top it off it only supports Window media Format. Don’t use your audio cables to watch your vids on your TV, because they simply won’t look right. I should also point out that these are first generation devices and they expect to get better in the future. 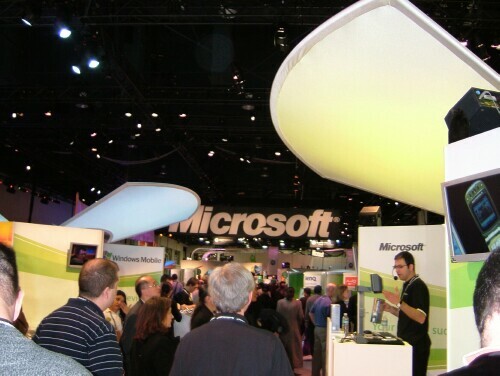 Microsoft also showed off a wide variety of mobile phones with all kinds of bells and whistles plus this new technology called “Smartphones”, there were also PC’s including 64 bits, and an automation demo much like what was shown at Control 4, but it looked fancier and more cozier. Finally the X-box was on display, but nothing too impressive. I think they were saving the big news for E3. Overall it was not a bad showing. ATI was onboard showing off their latest products in graphics technology. I am quite familiar with the ATI name having run a few of their Radeon products in the Val cave’s computers. Their biggest showing was the Radeon Xpress 200, which is made specifically for 64 bit computers. You will be amazed at what this new vid card can do and what it can handle. What I saw on the show floor looked really good. But hey I wanna test it my own way so I look forward to giving their new cards a serious spin. What can you say about a company that tosses at you a wide variety of TV’s, DVD players and recorders, plasma, lcd, and hi-def TV’s, with the added twist of Austin Powers and Felicity Shagwell to talk about their products? You say “They’re smashin baby, yeah! !” LG had a great looking booth with all their products nicely spread out making it very easy to navigate from one area to the next. What was most impressive was the Vx8000 mobile phone with its 1.3 megapixel camera, which they actually took pictures of people, printed them out and placed them in these really cool frames. Yeah, baby. But that’s not all they also showed off what they claim as the “World’s Largest Production 71” Plasma TV”, among other Plasmas which looked really good, a host of DVD players and recorders, and a variety of home theater running recent movies such as Return of the King. 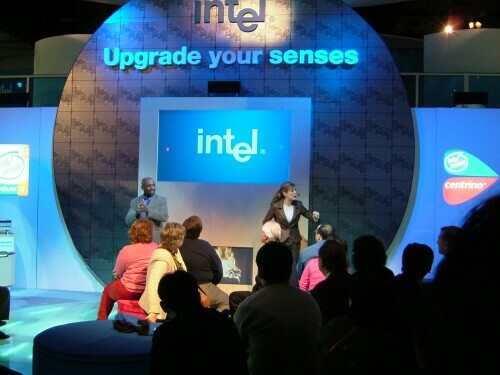 Intel was no slouch at the CES and they proved it with an impressive display followed by a happening demonstration to the tunes of Black eyed Peas and Aerosmith. They were showing a host cell phones, portable media and computers running Pentium products from Centrino to the Pentium 4. Their biggest focus was the Movielink, where for a price and high-speed capabilities, you can rent and download the latest or classic films and watch them on your computer, without fumbling with mailing anything back or late charges. (Ha to you Blockbuster!). They also had Iriver and Creative Zen showing at their booths and again at first I was impressed, until Apex and PQI came along. The Zen is neat to look at, easy to control and a lot of fun to play with. It’s very easy to scroll through the menus and if you get lost, just press the Microsoft button to take you back to the main menu. The video the Zen showed was low quality compared to the Apex and PQI models, but it played smoothly, without much jerkiness or slowdown. Intel I’m lovin it. The name I only knew in keyboards showed their stuff at the CES with a beautiful concert and an impressive display showing off a vast variety of musical products and digital cameras. One camera stood out for and it was the Exilim. Exilim is a 3.2 mp compact camera, that fits easily in the palm of your hand, but with its 2 inch LCD screen will show that you won’t have to strain your eyes to view your subjects. It’s very easy to use and comes equipped with 9.3 megs preinstalled, so you can start taking pics and soon as you take it out the box, plus you can opt to add an additional 64 megs of memory using SD cards. It’s got 2.8X optical and 4x digital zoom, also captures video, comes complete with USB cable, wireless remote and a battery charger. If you are a serious photographer of course your gonna look else where at the higher megapixel cameras, but if your new to the field definitely give the Exilim a try. Hey I thought Hyundai just made cars? Damn you had me fooled because they showed off some HD TV’s there were… well not greatly impressive, but sure to cause a ripple in the ocean of other HD’s coming out in the near future. Also look for Mp3’s, portable media players and mobile phones in the future. And I don’t mean in the vehicular sense. I love Coby products, they make the best damn headphones anywhere. Bar none. They also make portable CD players as well, but a portable DVD player that looks like a CD player, with a 3.5” screen? Well believe it, they have it, but damn it wasn’t running at the show so I can’t say much more about it. It looks pretty good though and a nice entry in the portable DVD field, but we need more info on the product, so come on Coby give us the scoop will ya? Other than that there was a fine selection of portable CD and DVD at their booth. 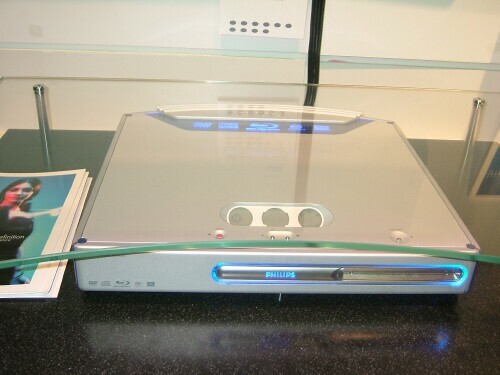 The makers of the awesome DVP642 Divx DVD player was on hand with a great display showing of their smaller products like lights and such to huge HD-TV’s and Blu Ray Machines. Blu Ray is no joke people it’s already on the market in Japan and though HD-DVD has the strongest hold, Blu Ray is gonna hang on till the bitter end. And with makers such as Philips backing them with quality product then it’s gonna be a pretty interesting battle ahead. Philips all plenty of HD-TV’s in all varieties strewn about, all of which were quite impressive. As the prices of HD-TV’s drop, its gonna be really difficult to decide which to buy. Their biggest thing going for them is “They got Stern! !” But that is still a ways off. (Or is it?). However people are insuring right now they have their Sirius satellite radio ready to go when that day comes. It was also announced that they were getting into the VOD market, but nothing was showing. Actually not all that much was displayed, except a few products, a sweet looking ride oh ya and Tony Hawk, guest hosting a live show where he fielded questions from the audience and looked to be having a good time. Time will tell when Sirius will show off the real goods. I found this booth very near the Microsoft booth. 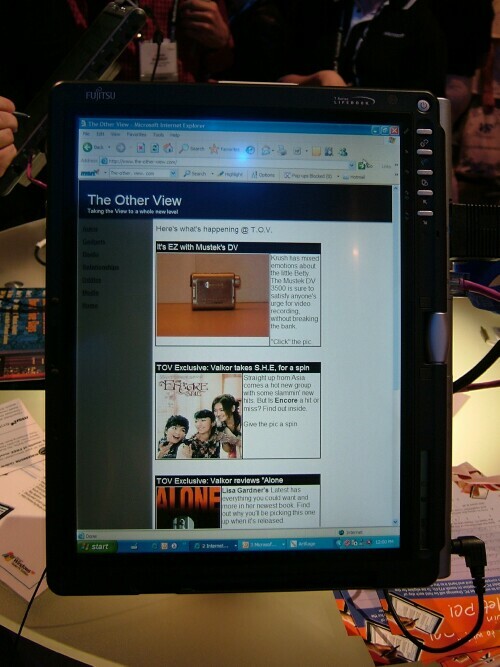 And with good reason too, their biggest showing (in my eyes) was the tablet PC. Basically take your Laptop monitor, add a stylus pen and a few buttons all around and Cha-Chung! You have a very big palmpilot that is more portable than the average laptop, but won’t fit in your pocket. Rather than being vertical, this PC is more horizontal and it’s not too heavy so you can easily hold it on your lap with no problem. It only took me just a few minutes to get adjusted to using a pen to navigate the desktop and the web on the tablet PC, but it was a lot of fun and hey you can even see a pic of TOV. 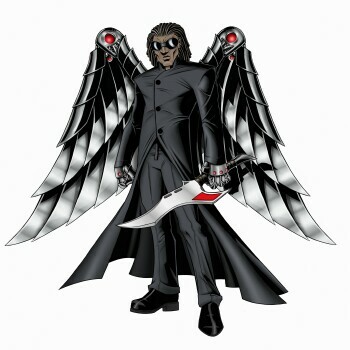 I want to see more of this so look for a review of the tablet PC in the future. It would seem that portability is the main theme of this CES show. Almost everyone had their best portable face forward and we the consumers are the ones to reap the benefits. If you have not already made that leap into portable media, make sure you check out TOV as well as other popular sites for the latest info on what is hot in this area. Overall day two was a lot more fulfilling and insightful than day one. Still no sign of Sony yet and I hear PSP is on display so for my final day I will make them TOP priority. Leave us not forget the smaller booths that I visited but didn’t stay too long, (And this is a big list of props) let’s give it up for Gem Sounds and their stylish DJing Equipment, Dish Network make a great showing with a really sweet walkthrough area, Homnet and their interesting remote control that just about controls everything in your household from TV’s to lights, XM radio rival to Sirius in the satellite radio market, Memorex was there displaying their recordable media as well as other devices such as a Karaoke machine. Sadly it wasn’t working at the time so I couldn’t bust out the funky phat beats, I’ll give kudos to Naxa because although these are the guys that simply make displays, they had a really nice display, Sanyo we shall not forget you, Yamaha (keyboards, yadda yadda), and finally RCA and their nostalgia TVs, there's Arista, Toshiba, and GPX. Whew Day two was rough, but if I don’t see the Sony booth before I go. I will explode.